Here is a list of all the women tennis players from Austria who are active in 2017. Also included are photos which show just how attractive these women tennis players from Austria are. The list includes a number of woman tennis players who have made very nice livings playing tennis. Hope you like the list and photos of these attractive women tennis players from Austria in 2017. Tamira Paszek was born on December 6, 1990, in Dornbirn, Austria. Tamira has won 3 WTA singles titles so far in her career and her career earnings are $2.5 million. Barbara Schett is the most successful woman Austrian tennis player. Barbara won 3 WTA singles titles and 10 WT doubles titles in her career and retired with prize money earnings of $3.1 million. You can still see Barbara Schett at tennis tournaments today as she is an announcer. Barbara Haas was born on March 19, 1996, in Linz, Austria. So far in her young career, Barbara Haas has won 10 ITF singles titles and has career earnings of $200,000. 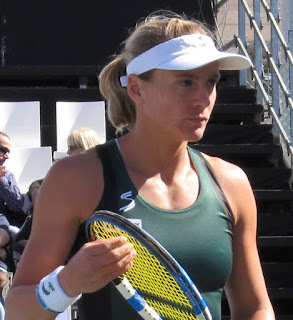 Sybille Bammer won 2 WTA singles titles in her career and had career earnings of over $2.1 million.